President Bush and his spokesman have welcomed the planned “anti-war” and anti-Bush demonstrations in Britain as an example of free speech. But what the President and his administration ought to be doing is exposing and confronting the anti-American forces behind them. We certainly can’t expect the media to tell the American people that communists, socialists, radical Muslims and other America-haters are organizing the protests. These are nice words, and we all support free speech. But these are not spontaneous demonstrations of conscientious objectors who oppose all war. Some of the key groups and individuals want America to fail in Iraq, and they want American soldiers to die there. Other individuals on the steering committee include Mohammed Aslam Aijaz of the London Council of Mosques, Lois Austin of the Socialist Party, Lindsey German of Socialist Review, John Haylett of the British Communist Party newspaper Morning Star, Mark Hoskisson of Workers Power, John Rees of the Socialist Workers Party, Carlos Rule of the Socialist Labour Party, Tanja Salem Al-Awda of the Campaign for Palestinian Rights, and Wolf Wayne of the Green Socialist Network and Socialist Alliance. The coalition’s website not only opposes the war in Iraq, it opposes the war on terrorism in Afghanistan and elsewhere. While the group claims “compassion for those who lost their life” on 9/11, its says that “any war will simply add to the numbers of innocent dead, cause untold suffering, political and economic instability on a global scale, increase racism and result in attacks on civil liberties.” Hence, it opposed the war to overthrow the al Qaeda-supported Taliban regime in Afghanistan. Another steering committee member is Tariq Ali, author of the new book, Bush in Babylon: The Recolonization of Iraq. 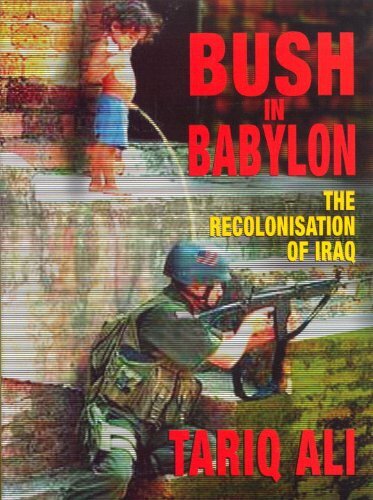 The cover of the book  depicts a boy in Iraq urinating on the head of an American soldier. A fascinating aspect to the British protest is its American connection. The “Stop the War Coalition” features a set of links to its collaborators abroad, including Moveon.org, International ANSWER, and United For Peace. The latter two groups are heavily infiltrated by communists and have played the key role in “anti-war” demonstrations here. Moveon.org  is regarded even by the liberal U.S. media as a front of the Democratic Party. The group has benefited from millions of dollars from George Soros and Peter Lewis, financial backers of the drug legalization movement. Another key group working with the “Stop the War Coalition” is the British Campaign for Nuclear Disarmament (CND). It is left over from the days of the Cold War, when the CND opposed deployment of American cruise missiles in Europe to counter the massive Soviet nuclear-weapons buildup. Key leaders of the CND were exposed at the time as being communists or communist sympathizers who attacked British and American defense policies while praising the “peace” propaganda of the Soviet Union. Then, British Prime Minister Margaret Thatcher and U.S. President Ronald Reagan were determined to confront Soviet power. They faced down the Soviet Union and the rest is history. President Bush must seize this historic opportunity to expose and confront another global movement that wants to bury America. He must identify these “protesters” as essentially the same group that was prepared to let communism dominate Europe and the world.